Yesterday I needed some of the productive procrastination that the Screenplay Side Project was designed for. I managed to do some writing in the morning, but by noon my creative juices had completely dried up. So, true to my promise to myself, and to the process, I packed up my laptop and went on a poutine walkabout. When I left my office, I originally had my sights set on a place I talked about at the end of my first post - Plan de Match - but when I got to the North East end of town and went in to the tavern, it wasn't quite as the exterior advertised. Inside, I was met by an artful chalkboard menu listing cottage brewery beers on tap, and designer ambient lighting overhead. The enticing original dive had become what's called a "hypertaverne" (tavern euphemism for - gentrified), and poutine was apparently one of the first casualties of the hyperization. Right away, the place made me smile. It's made up of two, side-by-side railcar narrow rooms full of booths with faded brown leatherette upholstery and low stools at the diner style counter. The lone TV dominating the middle of the room was tuned to the news feed of the second day commission sur la charte of quebec values. I took a seat in one of the booths where I had my very own juke box. Each and every booth had one!! I was in heaven. And yes, there was the requisite Bienvenue Welcome placemats, the big glass of water and the peppers in jars that had no intention of ever leaving them. Despite the juke box at every booth, there was no music playing. Just the LCN channel in the background. On the plasticized menu, the usual suspects were on offer, alongside some classic Chinese Canadian dishes. And poutine. One Waitress - her short, short cropped brown hair, and her white t-shirt went well with her burly body language. I was the only female customer in the place. The others, to the man, wore baseball caps. At least one did not wear his upper teeth. With each new arrival, it becomes clear, everyone in this place knows everyone else - at least on casual joking terms. As the rush hour for take-out picked up, a jolly, too-loud, long haired waitress arrived for her shift to take the increasing calls and handle the cash - and in between, related her snappy comebacks to vaguely obscene prank phone calls to anyone who would listen. By the time I paid my bill, there was more colourful staff than colourful customers in the place. A little edgy - the place is at a major intersection of a halfway house row, where there's a proportionately large population of older, single, slightly frayed at the edges men. 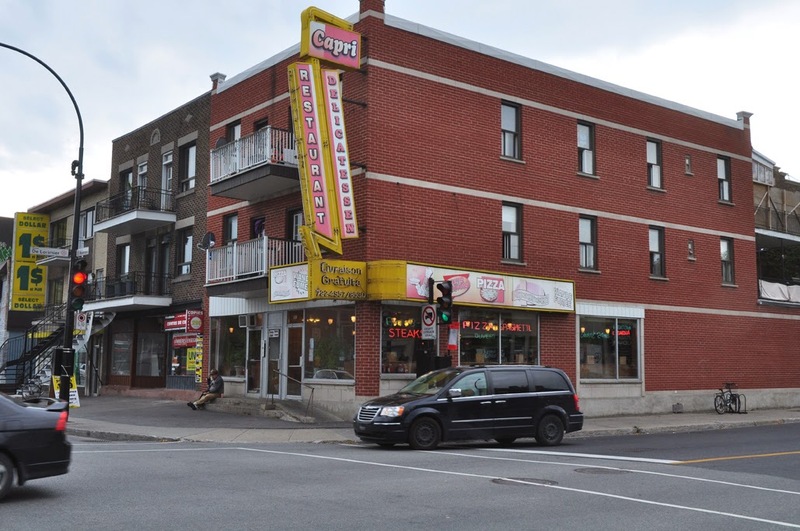 On the same block you'll find: a Karaoke bar with a live DJ, a massage spa with one-way windows offering "relaxation", a dollar store, and an insta-cheque outlet. Portion: Moyenne. Served on a proper diner style side plate - and on the generous side plate of moyenne. French fried potatoes: This one was a real equal opportunity poutine - no age-ism or racism prevented the older used-up fries, the darker fries, the broken, stubby or recycled fries from being included in the same plate with the younger, lighter, healthier variety. In fact, they were the majority. In the whole plate, there was maybe one or two more fresh-faced junior fries that still gave off a strong essence of the potato from which they came. The rest, however, tasted only of the old oil and bitter disappointment they’d been marinating in. Sauce: Unlike most poutine sauces in town, this one was of the department store cafeteria brown variety that came on the plates of fries and gravy my friends and I would splurge on on Saturday trips to the mall out west where I grew up. The kind of sauce that, if you leave it sit for a few minutes, grows a very light shiny skin and can almost be mistaken for burnt butterscotch pudding. But - pleasingly for this prairie girl anyway - full of good homey, stock style flavour. Comfort. Curds: Again, I cannot hide behind any pretence of objectivity on the curd question. This, even more than the sauce, or the fry is the hinge on which hangs the pleasure (or not) of poutine. In the case of the Capri, the question of curd is not even raised. There is not even the pretence toward curd. There is only string. And on string a poutine cannot hang. So, I have to argue that this dish has been mislabeled on the menu. In my opinion it can only be rightly called : gravy-covered, fried fries au gratin. Blend: Proportions of fry to curd to sauce are difficult to calculate given the total absence of one of the three ingredients. I suppose it's possible that if there'd been more critical curd mass, there would have been a better overall balance. But, as it stands now, the sauce has been put in the position of greatly overcompensating for absence of substance.